They look nearly done, don't they? But looks, my friends, can be decieving. I screwed up the ribbing on the socks. One is k2,p2, and one is k1,p1. The k1,p1 stays up better. The one with the finished toe is too short. So there will be ripping and reknitting of those areas. *sigh* I have quite a bit of laundry to do today, so I guess I will launder and knit. And launder and knit. Here's the super strange part. I bought the knitpicks parade and totally missed the part where it was only 137 yards per ball. But both of these socks are from the first ball. 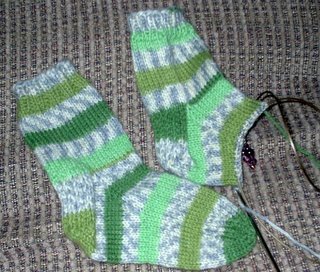 I started using this yarn for boy socks because I thought I would run it. I think I might be able to get two pairs of boy socks out of this yarn. Strange, no?